In 2012, I won a contest from Best Buy Canada. The contest asked applicants to write about what they would purchase at Best Buy if they had any amount up to $20,000 to spend. Since it had long been my dream to be a 1-to-1 computer classroom, and I was intrigued by the possibilities that iPads held for young children, I chose to say that I would purchase a class set of iPads. While the initial and on-going management of 30 iPads is no mean feat, I have loved having this opportunity for my grade one students. Some day I may blog about specific apps or ways of using them that work particularly well for me, but the recent summer break gave me an opportunity to reflect on some of the overall changes that have happened in my classroom. When I was able to put a device into the hands of every student, one of my fears was that the students might focus on the screen, the way many children do with a television or a computer. Those children become absorbed by the device, ignoring all that is going on around them. Happily, this has not at all proved to be the case for us. 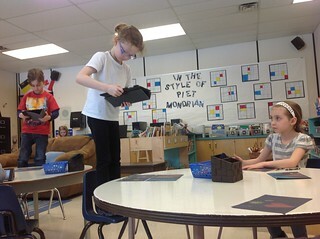 The students did not want to just use the iPads; they wanted to share them. The hum of voices excitedly talking to their peers about what they were doing was just the same as it had always been. They just had different things to share. Oddly, this showed up in an interesting way in my classroom. The couch was a popular place to work, but once that was full, some students would pull chairs next to the couch forming a line of learners sitting side by side. This happened over and over. When that line was “full”, the next students would make a line in front of the couch. The only logical reason I could see for this was their ease in sharing what was on their screen. And share they did. There was a constant chorus of “how did you do that?” and “look what I did” going on in my classroom. Over many years, I have been moving from a teacher-centered classroom to a student-centered one. One of the things I have come to value most highly is choice. I have offered my students as much choice in how they learn and in how they demonstrate their learning as I can. The iPads have given my students so many more opportunities for choice. For example, at the end of a unit of inquiry, I ask the students to share their learning with me through an artifact that they create. There were always a few digital choices available in my classroom, but the iPads have given us a rich variety of options that were just not available before. The students can now choose to use photos, podcasts, screencasts, video, inter-active books…well, you get the idea. My only criteria is that whatever they produce, they must have some kind of digital product that can be archived on their digital portfolio. Interestingly, the run away favourite method to sum up what they knew was to draw pictures with markers, to post these pictures on a large sheet of construction paper, and to make a video of themselves talking about the images they had drawn. The iPads offered a variety of ways to do this. Keeping students engaged is never really an issue in grade one. Six year olds are interested in most anything. If I told them we were going to do some rote practice of math facts with enough enthusiasm, they would probably cheer about it. Having said that, they were indeed engaged! The opportunity for them to have access to a device with a variety of apps that could allow them to explore and create was something they loved. My children were not using their iPads in every spare momentâ€”they still liked other classroom tools such as Lego, dominoes and drawing paperâ€”but the iPads were a popular choice, even at lunch hour or recess when the weather was too cold to go outside. Having iPads gave my students a new way to learn things that were not part of our curriculum. I put some apps on our iPads just because I thought they looked interesting, and not because I had a direct plan for them. One of the apps was GarageBand. I had never used it, but I knew that other teachers had used it in interesting ways, so I added it. I didn’t get around to figuring out how to use it, but my six-year old students did. They taught themselves and then taught me. We were able to save some of their music and to use it for our classroom videos. The same was true of a clay modeling app called 123D Sculpt. Again, the students figured out for themselves how it worked. We never did post any of these clay creations anywhere, but the students loved to use it. This past year, my students were fascinated by what you could do with dominoesâ€”both with setting them on their ends and watching them fall and with seeing how high they could be stacked. They tried various ways to stack and as they got better at this, one student or another would use an iPad to document this learning as it was happening. They did this independently, without any prompting from me. It was just something they wanted to do. I strive to help my students to understand themselves as learners. I want them to choose ways to help themselves learn that work for them, not necessarily for me. For some skills, such as reading, spelling and counting, there is just no substitute for practice. The iPads gave my students additional ways to practice each of these skills, finding a way that best helped them to learn. I would sometimes suggest a way to practice that I thought would work well, but I generally trusted them to make the decisions they needed to make for what worked for them. To practice each of these skills, my students sometimes chose digital and sometimes non-digital means. 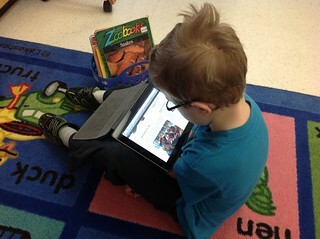 For example, I put many eBooks on the Kindle app on our iPads as an option for our independent reading time. The students could also read blog posts by the teachers or students in other classrooms. They could read our Twitter feed. Or they could read books. Some students preferred digital and some preferred non-digital, but most moved seamlessly back and forth between the two. There was something very special for my students in having their own device. They never had to wait their turn. Whenever they needed it for learning, it as available to them. All of the photos, videos and other artifacts on the iPad were theirs. No one was deleting things that were important to them. They looked after the recharging and care of their iPad. If they forgot to charge their battery, they had to stand by the charging shelf as they worked. I don’t think anyone had to do that twice. I realize that money is a huge factor in the 1-to-1 issue. We were lucky. There are presently very few models that allow this choice for everyone. No other classrooms in my school have this option. Having seen the results for myself, though, I think all of us in education need to do some outside of the box thinking about how we can make this happen. I know one teacher who held weekly pizza sales at lunch to make it work in her classroom. Do you have other ideas? I’d like to hear them. This kind of learning needs to be spread around. If you enjoyed this post, be sure to check out Kathy’s new article at the IRA’s Reading Today blog: Career Education in First Grade? We can still move away from a teacher centered model to a learner centered model of teaching even though we have no money for technology. It all depends upon the preparation of the teacher and the DRE. 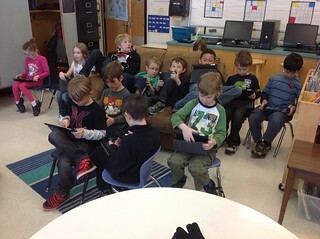 Collaborative learning does not depend upon iPads – but it does depend upon the skill of the teacher . It is more the method than the device. It would be wonderful if parishes could support such technology both $$$ and physically – like making sure that there is wireless access. However, many parishes and dioceses barely support religious education programs as is; it will take a Daddy Warbucks to get the kind of technology of which Ms Cassidy speaks . The other issue is that so many dioceses refuse to believe that we need to “flip the classroom” or at the least mirror the way that children learn outside of religious education classrooms. There has been a noted “rush to the past” with the insistence upon catechism like texts as THE ANSWER. I am happy for Ms Cassidy and her cherubs; I am sad for the religious education endeavors that lack the simplest support. I did not mean to imply that you cannot have a learner centered classroom without technology. I have been moving towards a learner-centered classroom for many years, and as you can see only one of those years has had iPads. In all honesty, the iPads did make it easier, but my intention was not to say it is the only way to change education. There are many ideas that people are experimenting with, including the flipped model. I applaud all of these. I am only disappointed when people think that the way we have always done things is good enough and no change is necessary. I went through your Post ,enjoyed reading your post and thanks for sharing updating new educational based articles…. Our district is about to implement a 1:1 program. However, we are having some trouble seeing the opportunities for our grade level (first grade). We feel that the students are so limited in their abilities (ie. reading, writing/typing) that there very few options for us to succeed with 1:1. I am really hoping we can receive some ideas or approaches to help us with this “adventure”. FYI- Our tech. director is using the SAMR model. Therefore, the new activities and technology implementation needs to work in that regard. I think that the important thing about the SAMR model is that it is more about a teacher’s way of teaching/thinking than it is about any particular kind of technology or ability on the part of the students. You cannot think that the best way to learn is by practicing skills on a digital worksheet and hope to achieve the higher levels of that model. In my classroom, a couple of our favorite apps to use are Draw and Tell and Explain Everything. These apps allow students to use drawing, text AND their recorded voice to explain, to teach or to share their learning. Once you save these “creations” to the camera roll, they can be shared in a wide variety of ways, my favorite of which is to post online. The online portfolios that my students create (mscassidysclass.edublogs.org) can then be viewed and commented on by their parents, friends and people they have never met. iMovie is another popular app in my classroom. Making a movie and sharing a students’ passion can educate, inform, move and inspire others to action. 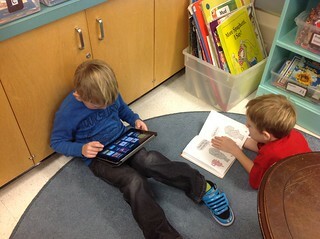 These are certainly transformative ways to use iPads in first grade.